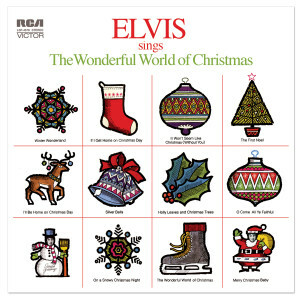 Elvis' excellent first Christmas album, Elvis' Christmas Album, is a fine collection that would be a welcome addition to any Elvis fan's stocking. Elvis Sings The Wonderful World Of Christmas includes a number of seasonal standards ('O Come, All Ye Faithful', 'The First Noel', and 'Winter Wonderland') as well as such newer songs as 'On a Snowy Christmas Night' and the title track. The highlights of the album are a gritty six minute version of Charles Brown's hit 'Merry Christmas Baby' and the version of 'Blue Christmas' Elvis performed on his comeback television special. I had this CD for years, and the 8-track before that. Every year I’d listen to it while decorating the tree. Through an unfortunate event, my CD was thrown away last year. This year as I was putting lights on the tree - FedEx showed up with my new copy (thanks to a surprise from my husband). The timing couldn’t have been better! My only complaint - this copy does not have “Blue Christmas” on it; the other one (and 8-track) did.